Another round of SHIFT-IT is right around the corner! 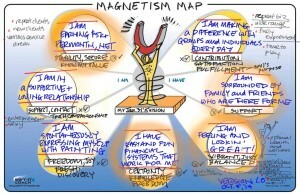 Powerful container for anybody in a transition or itching for subtle or strong change in your professional and/or personal life. To contemplate what’s next, how come, with whom, when … and how you are going to get there! It’s my signature Visual Coaching program (offered online in a group setting with participants from across the English speaking world) that holds space for you to do concentrated thinking, feeling and doing about yourself, your life and your trajectory. This is my twelfth year facilitating SHIFT-IT … and my love of this deep and profound process just gets stronger and stronger. As does interest in it … and my research about how and why people shift. 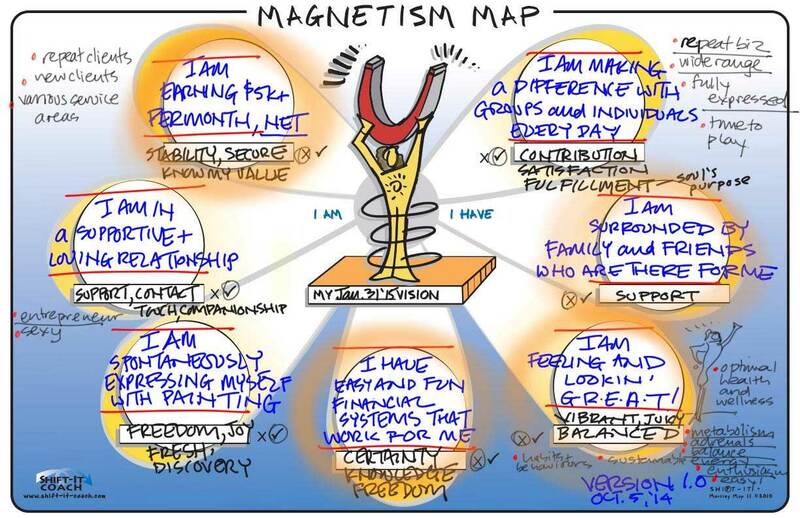 Although I have an organizational background, I’m a pioneer in integrating visuals into personal growth work … so you can REALLY DEEPLY SEE yourself and make the changes YOU want to make. 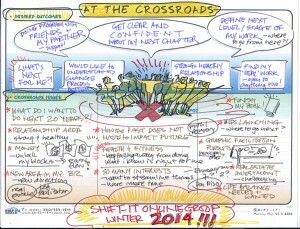 SHIFT-IT is a visual process; as at its heart are 14 tried and true Visual Maps. Which are, as I like say “deceptively simple”. They may look cute, however they do a very thorough job drawing the real you out! 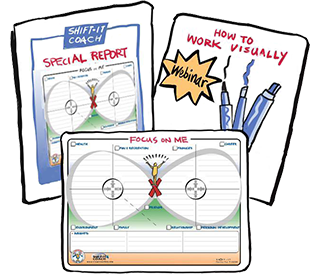 Even though SHIFT-IT is a visual methodology, you don’t have to be an artist to use it — the shift doesn’t come from the art, it comes from your insights, feelings and energy underneath what you write or draw out. If you ARE an artist, or are in the process of developing your visual skills, then you’ll appreciate this approach as you can doodle your markers down to their nibs if you want! 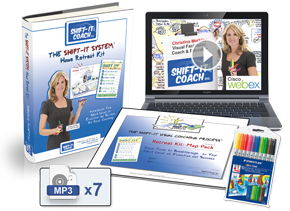 SHIFT-IT Online is great to do solo (you won’t be for long as I introduce you to wonderful people). Or to entice friends and colleagues to do too. One cohort we had 5 friends do it together and it was so fun to see them kid, encourage and support one another … and also integrate beautifully into the larger group. There’s nothing like literally drawing out your life to see where you stand and clarify what’s truly important to you NOW and doing that in supportive company. Let alone motivate you to make your desired changes and stay accountable. Technology now enables us to connect in ways we could only imagine just a short time ago. When I started SHIFT-IT back in 2003, I hosted groups in my living room. 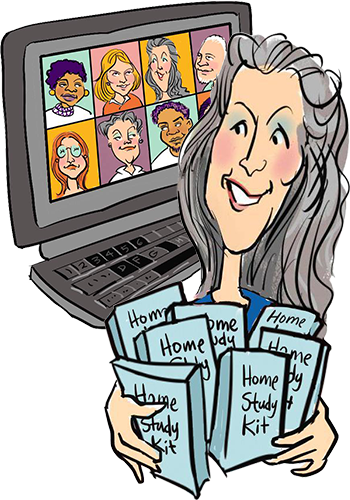 Now, with the magic of webinar technology and a private forum, I connect you with like-minded and hearted people … all from the comfort of your own surroundings! Which is nice when you do this kind of work … to touch base with us each week nestled in your own cocoon, as you go through this transformational experience. Are you a coach, therapist or other Process Professional who works with individuals? If so, not only will you get your inner work accomplished you will also meet one of the two pre-requisites for Visual Coach Certification. 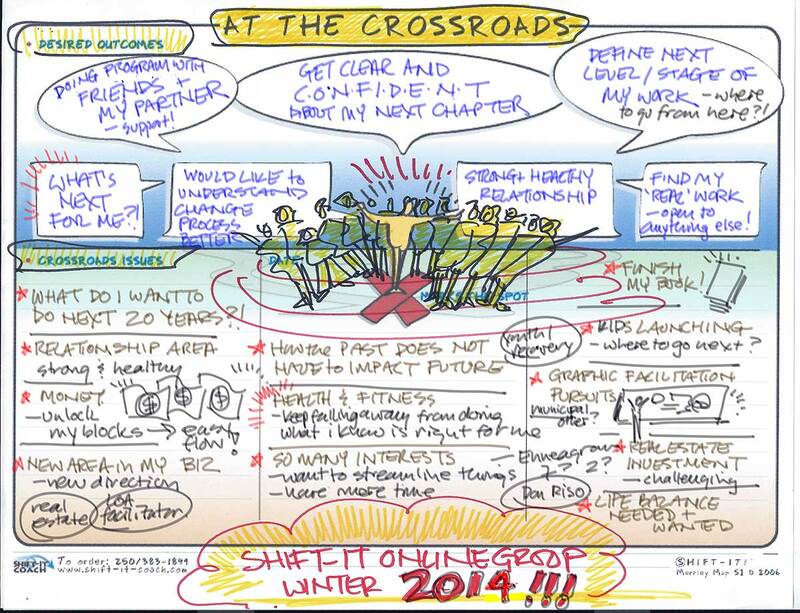 This offering of SHIFT-IT is the last live opportunity before our 2015 Visual Coach Cohort starts in April. 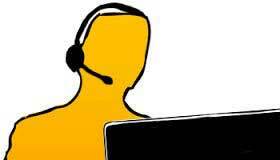 So act now to get your needed pre-requisite completed! P.S. Handy REPEATER OPTION for those who have participated before and are ready for your next round! P.P.S. 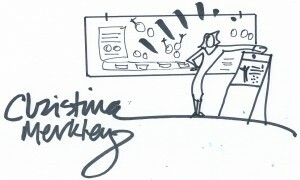 Are you on my list because of an interest in working visually? FYI, for the next offering of Fundamentals of Interactive-Visuals (including our new Home Study Version), click here. P.P.P.S For a full roster of classes, products and private coaching and training click here.